Interview With the demise of Bitcasa, EMC selling off Syncplicity, and so forth, the enterprise file sync and share market might appear moribund. What’s happened is a trend of consolidation plus an addition of functionality for other content functions. EFSS on its own is no longer viable. That’s the underlying message we received from Egnyte CEO Vineet Jain when we asked him a series of questions about the EFSS market and its trends. He’s a polished CEO and adept at answering questions in a way that favours Egnyte; that side of things is pretty transparent. We’ve edited his answers for brevity, length and some style, replacing “solution” with “product” where we could. El Reg: Three years ago the EFSS market was one of the hottest in tech. 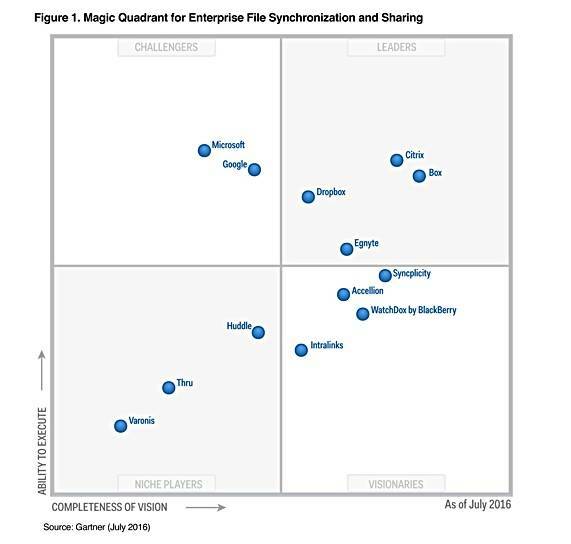 Gartner even created a new MQ specifically for it. Now, three years later, vendors who seemed to have a promising future are disappearing - Bitcasa, Hightail (YouSendIt), Syncplicity, and more. Why is this? Vineet Jain: EFSS became popular since it was addressing basic needs for file storage with easy access and simple file sharing. Whether you were using it in a business setting or in your personal life, those needs existed and were being addressed with EFSS solutions. As their popularity grew in the hands of consumers and prosumers, EFSS-like capabilities started making inroads into enterprises. Now the need for security, control, audit - beyond simply storage and file sharing - became important and lots of “consumer” class solutions could not deliver. Further, as it happens in enterprise software, a new breed or category starts taking dollars away from something else in the budget. So IT started leveraging EFSS beyond the core value prop and into content consolidation, optimising old storage vendor footprints (read EMC, NTAP etc), tying in with other cloud apps (Salesforce, Docusign etc), Governance - and EFSS needed to evolve into a platform play. Once again, several vendors dropped out since they could not extend their products into a platform. The key to growth in EFSS therefore has been going beyond a consumer grade product evolving the core capabilities to be a platform/backbone for all your content. El Reg: There are players like Box, Dropbox and yourselves [Egnyte] and the other vendors who have been doing EFSS OK for 10+ years. In what way should they have built out their platform? Is the EFSS marketing getting segmented? Vineet Jain: There is an inherent issue with the architecture behind many of the EFSS products on the market. They were built with simple use cases in mind - creating access, file sharing, and auditing. As the digital workplace has expanded with more devices, more apps, etc, these simple EFSS solutions were unable to meet the more complex use cases. Therefore they could not be implemented across larger, globally distributed organisations, which is a death sentence in terms of success as a SaaS provider. It is not hard to understand why many have not survived as their simple architecture is extremely difficult to retrofit or reverse-engineer. El Reg: Are new entrants like Druva (end-point protection origin) and CTERA (security focus) having an effect on the EFSS market? How is that market going to develop? Vineet Jain: Infrastructure modernisation, which is driven by the expansion beyond EFSS, affects many aspects: hybrid, security, data governance, auditing etc. Companies like Druva and CTERA then become an integral part of the puzzle. As you mentioned they are solving different niche needs as a part of the bigger picture. It remains to be seen if they will also expand into adjacent markets to solve other issues/business needs. We see Egnyte being a bigger platform that can provide multiple solutions. The key will be to have flexible architecture that can deliver on all of the evolving use cases from businesses, while also having the sales model to support it. The jury is still out on how the market will shape up and who will take charge, but it is clear that many of the successful companies from other areas, like EFSS, are converging here. El Reg: Is EFSS a product or a feature? Vineet Jain: Because of its duality serving both IT and users, EFSS is definitely more than a feature. You can call it a product but that often sounds like something you buy one time and keep as is. I prefer to think of it as a solution. It is a solution that has continuously evolved and has now become a part of a much bigger platform that is helping to modernise infrastructure. El Reg: Box is the only EFSS company to IPO. Why is this? Vineet Jain: Box IPO’d before the expansion beyond EFSS started happening. Therefore, their perceived value was based on their ability to execute in the EFSS market. Right now, as we expand beyond EFSS, companies like Egnyte are growing into adjacent areas like data management and data protection. Therefore companies like ourselves need time to differentiate, grow, and show success in these new areas so we do not receive an under-estimated valuation. Egnyte is not a pure play EFSS vendor anymore and therefore we should not be valued as such, which is why we have not rushed into an IPO (and presumably others as well). Once there is ample time to demonstrate viability in these new markets, then you will likely see an uptick in IPO activity. El Reg: You predict that there will be 3-4 companies in this space who will survive 2017 as independent companies, while the other 10+ vendors will die a slow death - either being swallowed up by one of the “tech giants" (Microsoft, Google, etc.) or simply being forced to shut their doors. Who are the 10 vendors? Vineet Jain: I would venture to say that anybody on the Gartner MQ (and any other analyst research) who is not 1) a leading vendor 2) a bigger corporation like Citrix, Microsoft and Google. El Reg: OK. That means Syncplicity, Accellion, WatchDox, Intralinks, Huddle, Thru and Varonis. Who are the three or four survivors? Why do you think they will survive? Vineet Jain: Dropbox because of their consumer dominance. They have the most content in the market and should find a way to monetise it at some point (like Facebook). Box because of their massive spend on visibility/brand awareness. They bet on users to dictate and drive IT environment changes as they are vertically integrated. Egnyte because of our flexible architecture and ability to address unique use cases at scale. Egnyte takes a more horizontal approach serving both IT and users, focusing on the content and partnering to provide the best-in-class functionality from complementary solutions. Microsoft/Google/Citrix because of their size. They will invest until they have something that works. They also all have a stack that their customers are simply willing to stick with for pricing and/or ease of use. Google has a lack of footprint and focus on the enterprise, which continues to pose a threat for them. Microsoft is new to the infrastructure business (especially on-premises) and they will need to make up ground there. El Reg: What is Egnyte's strategy? Vineet Jain: While still providing an EFSS product, we will continue to expand to provide content collaboration, content management, and content governance solutions that can run on any content repository - making us unique to our market. Our horizontal approach is a vital part of our strategy, giving IT the ability to modernise their content infrastructure and users the ability to customise their digital workplace. We will continue to focus on the quality of our solution, not exhausting any resources on freemium (free users), and focusing on corporate-wide deployments that can be scaled to large enterprises. We will strengthen our partner ecosystem and build out our sales force to meet the increasing demand for our platform. The EFSS scene has broadened to include general data management, data protection and content governance. With new entrants like Druva and CTERA, the market's evolution is uncertain. It wouldn't be beyond expectation for an acquisition or two to take place, enabling technology extension.